“From the creators of The Matrix Trilogy,” the posters for Jupiter Ascending say, and those credentials do not expire. The night before The Matrix opened 16 years ago, the trailer for The Phantom Menace, still seven weeks away, was more hotly anticipated than that weird goth videogame kung-fu movie with Keanu Reeves. Nearly a generation after The Matrix put a fresh coat of pixels on The Hero’s Journey, Andy and Lana Wachowski must know how George Lucas felt back then. They’re establishment figures (in movieworld, at least) who had the misfortune of peaking early, and who have lots of ideas for movies, none nearly as appealing to the public as the one that made them famous. After adapting a beloved manga (Speed Racer) and an ambitious literary novel (Cloud Atlas), they’ve returned to quote-unquote original material with Jupiter Ascending, an honorable, no-expense-spared swing at a swashbuckling space opera that, by virtue of having missed its initial release date by half a year, can now be most helpfully pegged as Guardians Of The Galaxy without the Awesome Mix, the jokes, or that tearjerking sentient tree. On the contrails of a marvelous year for science fiction at the movies, Jupiter Ascending feels like the also-ran that it is: Though it strives mightily to compete in every category, it’s not as funny as Guardians, as awe-inspiring as Interstellar, as thrilling as Edge Of Tomorrow, or as provocative as Under The Skin. There’s a vaguely anti-corporate message in Eddie Redmayne’s murmured ruminations about how all of the Earth-based strain of humankind (it’s complicated) is waiting “to be converted into capital.” But that’s roundly overwritten by Channing Tatum in rocket-skates (! ), Spock ears (!! ), and Guy Fieri’s goatee (!!!) rescuing Mila Kunis from being violated by little gray men at an egg-donation center. And then again, much later, from her politically motivated nuptials to a handsome but ruthless alien prince. Of all the movies Jupiter Ascending openly quotes, The Graduate is the unlikeliest. As in The Matrix, The Terminator—that gritty little thriller-that-could—makes its presence felt. Thirty years ago, it was a much-abused waitress who turned out to be the most important person on Earth. Now it’s Kunis as Jupiter Jones, whose genetic code marks her as Earth’s queen and owner, though so far as she knows, she’s a mere Chicagoan who lives at home and cleans houses for a living. There are lots of shots of her scrubbing toilets while wearing heavy eyeliner, although not as much as Tatum’s Caine Wise—a “lycant” crossbred with wolf DNA for the military. He also used to have wings, but got them clipped for biting someone’s throat out—hey, can this be right? An even lower-budget ’80s movie, John Carpenter’s They Live, contributes the idea that Earth is just a backwater in a galactic economy controlled by a superior race. In Jupiter, three squabbling, British-accented alien siblings—played by Redmayne, Douglas Booth, and Tuppence Middleton, whose real name is arguably better than her movie name, Kalique Abrasax—each want to “harvest the Earth” for its life-extending elixir, which means getting rid of Jupiter. Only Booth’s Titus Abrasax secretly hired Caine to be Jupiter’s bodyguard or something? Help. What matters more than sorting out the convoluted-except-it’s-really-just-a-space-chase plot are the troubling indicators that would-be blockbuster filmmaking has arrived at its decadent, last-days-of-Rome phase. Jupiter Ascending gorges on eye-popping imagery: There are grand, cosmic vistas of bejeweled starships floating in front of the gas giant, a rocket-skate-vs.-rocket-sled chase that scars the Windy City skyline, and a fountain of youth filled with the liquified essence of puny humans. (It looks like mineral water.) After half an hour, these magnificent images, each one absolutely worth airbrushing on the side of your creepy van, inspire only droopy eyelids. Our overtaxed wonder receptors have burnt out. Redmayne is a Best Actor frontrunner for his performance as Stephen Hawking in The Theory Of Everything, but here, he’s more like a skinny drag version of Steven Seagal, whispering his lines semi-audibly until IT IS TIME! FOR HIM! TO SHOUT! He looks as comfortable as Michael Shannon did in Man Of Steel. 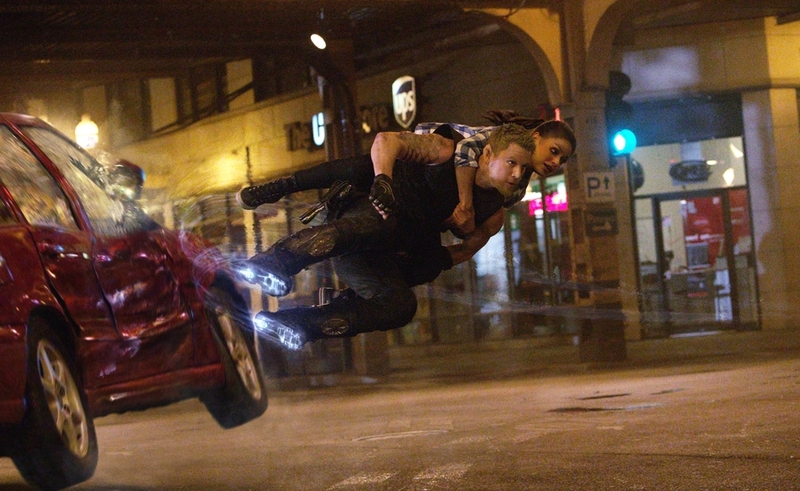 Jupiter Ascending’s revelations into would-be franchise-building are just as depressing as its gender politics. Moviemaking is a crapshoot, even when talented artists have what sure looks like it was a blank check, and though everyone does their best, sometimes nothing happens. People smell a fiasco and are rooting for this movie to fail. (Andy and Lana Wachowski want to wow us: What a pair of assholes!) Watching this movie means imagining vast warehouses of officially licensed Jupiter Ascending action figures and other merchandise no one will ever buy. Long after the movie seems to have burned off its modest reserves of novelty, there’s a delightful interlude wherein Caine and Jupiter try to navigate an intergalactic bureaucracy to verify Jupiter’s claim on our homeworld. It deliberately recalls Brazil, the brilliant dark comedy that Terry Gilliam famously had to smuggle out of Universal 30 years ago and screen for critics himself to prevent the studio from mutilating it. And there, in a cameo as a rubber-stamp-wielding functionary, is Gilliam himself, an uncompromising artist who’s spent most of his career trying to get his sometimes-brilliant, often indecipherable movies funded. The Wachowskis can relate to him, too.